If gardening is a new interest, you've chosen the right place to begin. Amaryllis deliver huge, brilliant flowers, in abundance and in lots of jazzy color combinations. Some are even fragrant. They are also - surprisingly - among the easiest plants to grow. The amaryllis offered here don't need any special cooling or conditioning and will come back year after year with a bit of care. Let the fun begin! Many people don't think of outdoor garden sites when they consider amaryllis. But for enormous blooms, year after year, these plants really shine. Showcase 5 - 7 bulbs on either side of your front door for a display that guarantees tremendous curb appeal and prompts a satisfied smile when you step out of the car. Find a location where the soil drains well. If there are still water puddles 5-6 hours after a hard rain, scout out another site. Or amend the soil with the addition of organic material to raise the level 2-3" to improve the drainage. Peat moss, compost, ground bark or decomposed manure all work well and are widely available. Amaryllis must not sit in soggy soil or the bulbs will rot.Site your amaryllis where they will receive full sun. Amaryllis will grow in light shade but tend to develop stronger stems and better proportions in brighter light. Dig holes and plant the bulbs with an inch of the bulb above the soil surface. This is sometimes referred to as planting "up to the shoulders" of the bulb. The top of the bulb is the part that looks a little like the stem area of an onion and the bottom has a flat plate, often with a few roots attached. After planting, water well, gently soaking the soil and settling it around the bulb. Then ease off on the water; your bulb doesn't need moisture when there isn't yet growth to support. Amaryllis may be planted from September through April in warm weather climates. While occasionally flower stalks will develop in the fall, easpecially during the first season, mid spring is the typical time for flowering. When in bloom, feel free to cut amaryllis flowers for fabulous bouquets. Amaryllis aren't used widely in the U.S. for cuts but they are very popular in Europe. Pretend you're in Paris! After blooming has finished for the season snip off the old flower stalks but leave the foliage in place; don't cut it off. The leaves will gather sunlight, create food through photosynthesis and strengthen the bulb for the future. Water as needed during active growth periods, about 1/2-1" of moisture per week is a good estimate. In warm regions amaryllis foliage is evergreen and continues to look good year round. In zone 8, mulch your plants in late fall with a 3" layer of leaves or pine needles to reduce the chances of the bulbs being subjected to ongoing freeze and thaw cycles as these are hard on amaryllis. Remove the mulch in the spring to prevent moisture from being held against the top of the bulbs. Choose your containers with an understanding that big amaryllis bulbs develop very large, heavy flowers. To keep bulbs that are in full flower from toppling over, select pots, tubs or urns that weight several pounds each when empty. Or add some weight in the form of rocks or sand to the bottom of the containers. Fill your containers with good quality, well-drained soil. Almost any commercially available potting medium will work fine. Make sure there are adequate drainage holes; the bulbs must never sit in waterlogged soil or they will rot. Site the containers where they will receive sun for all, or most, of the day. Plant your amaryllis singly in pots that are a bit snug, ones with diameters 1"-2" larger than that of the bulbs. For several amaryllis bulbs in the same container, plant close to each other with shoulders about an inch apart for the most brilliant display. Tuck them in so that the top inch of the bulb is left above the soil surface. The top of the bulb is the part that looks a little like the stem area of an onion and the bottom has a flat plate, often with a few roots attached. Water well, gently soaking the soil and settling it around the bulb. After the initial watering, wait to add more moisture until after you see stem and/or leaf growth to prevent overwatering. The bulbs will develop roots as the tops sprout and occassionally flower stalks will develop in the fall. Mid spring is when amaryllis bloom is in full swing. If you like, take pots indoors in the spring, where light and temperatures are less intense; this often extends the blooming period. Enjoy your flowering containers and snip a stem here or there for use in a vase. This won't hurt your plants. When blooming is finished trim off the flower stems. The foliage is evergreen in warm climates and will continue to grow. Water as needed to keep moist through the growing cycle, typically once a week. 3 healthy and fresh Hedychium White Bulbs. 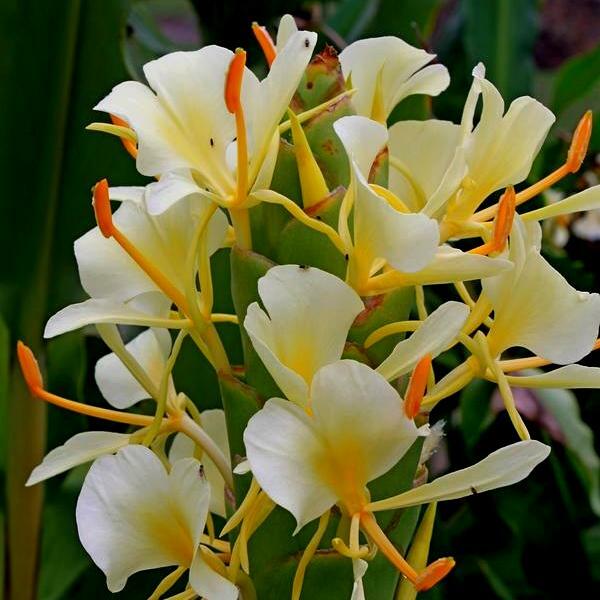 Hedychium White Bulbs bloom in summer.